Palten started working at TRACC about a year ago. In part two of our interview he shares some knowledge about what he’s learned from TRACC and how his view of the ocean has changed. Gon & Lark: Did you know about the work TRACC is doing before you started working at TRACC. Palten: Before I started working here I did not know about TRACC. I only knew Miti (another TRACC staff from Kalapuan). When Miti paid me to make the bottle reef I asked Miti what it was used for. Miti said only to throw it the sea. I was curious about why. At that time I only did what Miti told me to do because of the money. When Miti told me about throwing the bottle reef in the sea I wondered what would happen after with the bottle reefs. G & L: Now do you know why TRACC puts out the bottle reefs? P: To effect the fish and because it is beautiful, and with more corals there will be more fish. Because we have planted all the corals there, the fish will have a place to sleep. If it’s just sand the fish will have no place to hide. G & L: Since working at TRACC How has your view on the ocean and Marine Conservation changed? What have you learned since starting work at TRACC? P: My view of the sea has changed after doing the conservation work because the people I dive with love the ocean and it’s life. Now, I also have the same view. I love the fish; some of them are so cute. Some people that dive with me, show me really beautiful things that I can see underwater and now I am really interested. I have seen most of them before, but I didn’t care before. Now I appreciate them. The more I see them the more interested I am. Before there were a lot of beautiful things, now I see something that is more beautiful and there are always new beautiful things every time I go diving. G & L: Why do you think it is important to conserve the marine ecosystem? There are many beautiful things in the ocean and many fish, this means we can fish them. Without the fish there is no food. G & L: How would you spread the message of conservation to your family, the village of Kalapuan and the wider Bajau community? P: I want to take my family diving to show them the beautiful things in the ocean. G & L: What are your plans for the future? P: If possible I want to be a Divemaster. 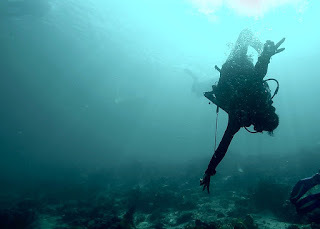 To be a Divemaster at TRACC would be good. What I want to do is show my family, the beautiful things to see underwater, so they can appreciate them, and how the conservation work would make their lives easier. Now I only tell the stories, when I can take them for a dive its better that they can see themselves. G & L: If you were not working for TRACC do you think you would go back to blast fishing? P: If life becomes really hard, I will do whatever I can to support my family. Even bomb fishing. But since I started working at TRACC I do not want to be a fisherman again. Read Part 1 of the interview!